"Under normal conditions, the reinjected T cells die off in a matter of days. Doctors can increase their staying power by depleting patients' blood of certain regulatory T cells that dampen the anti-tumor T cells' response to cancer or using Interleukin 2, which spurs the growth of T cells. We are getting so very close to a cure/stabilzation of this diease. Stimulation of naive CD4+Foxp3− T cells in the presence of TGF-β results in the induction of Foxp3 expression and T suppressor function. However, Foxp3 expression in these induced regulatory T cells (iTreg) is unstable, raising the possibility that iTreg would not be useful for treatment of autoimmune diseases. However, When IL-2 is added, the Foxp3 expression is stabilized. 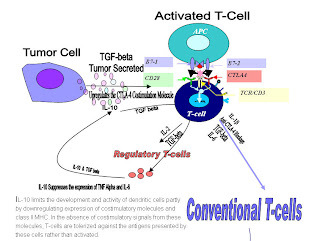 Why is this important, because the tumors secrete the TGF-β and the activated CD4+ T cells secrete the IL-2 for the propagation of the CD4+ T cells. This is the perfect storm for the tumor. The proliferation and survival the of the Tregs, makes it almost immposible to infiltrate the tumors’s microenviroment. The Tregs compete for the screted IL-2. 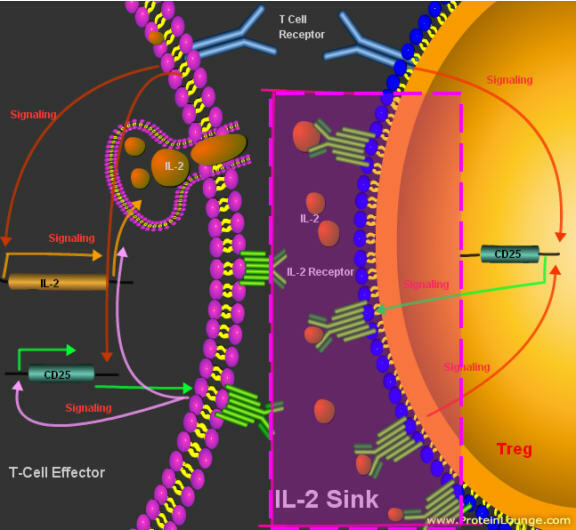 Depending on the location and how close the CD4+ T cell to the Tregs, The tregs can gain the upper hand by creating a IL-2 sink. 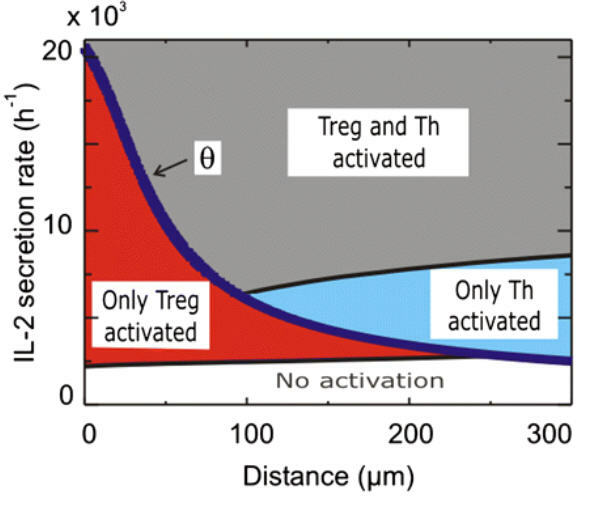 The Tregs must be neutralized to eliminate the surpressiveness that leads to tolarence of the immune system. Neutralization of IL-2 or disruption of its signaling by deletion of Stat5 diminished the level of Foxp3 expression resulting in decreased suppressor function of the iTreg in vivo. Blockade or depleting of the Tregs may be the only way to break the tolarence of the immune system. The basic premise of cancer immunotherapy involves enhancing the body’s own immune system to fight off cancer. It sounds logical and simple in concept, but the practice is complicated. THE need for more effective and targeted therapy for cancer has always been in the minds of researchers and doctors who treat cancer. The traditional methods of treating cancer, ie surgery, radiation, and chemotherapy, have obvious limitations. Surgery would not be effective in disseminated or widespread diseases, while radiation and chemotherapy cause “collateral damage” due to effects on normal cells while killing off cancer cells. Certainly, a treatment modality utilising and enhancing our immune system to prevent or fight off cancer is a sound and attractive concept, hence the basic premise of cancer immunotherapy (CI). The traditional methods of treating cancer, i.e surgery, radiation, and chemotherapy, have obvious limitations, hence the surge in interest in cancer immunotherapy. There is a general belief that failure of “immune surveillance” is a main contributory cause of cancer arising in an individual. There is also evidence that in many cancer patients, the immune system slows down the growth and spread of tumours. This means we need a competent immune system to prevent cancer, and to prevent it from spreading once cancer has started. 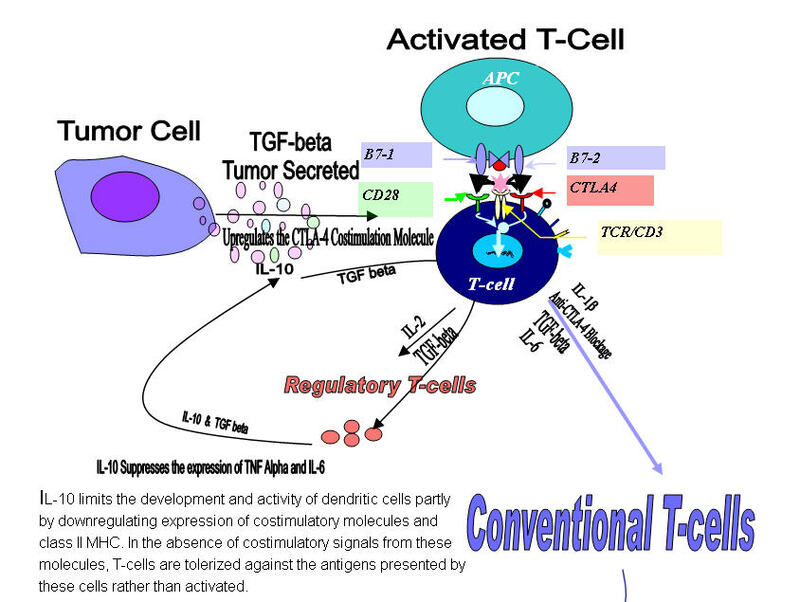 The basis of CI, ie enhancing the body’s own immune system to fight off cancer, sounds logical and simple in concept. Unfortunately, like most things in life, the real scenario proves to be far more complicated, and the quest for effective cancer immunotherapy has taken a long time. But slowly and surely, we are unraveling the mysteries. What are the ‘tools’ of CI? To battle cancer cells with immunotherapy, we can either stimulate our immune system, or transfer antibodies or T cells from an outside source. Certainly, immunotherapy involving certain cytokines and antibodies has now become part of standard cancer treatment. Other examples of immunotherapy, especially those involving cellular therapy, remain largely experimental. Although many clinical trials of new forms of immunotherapy are in progress, an enormous amount of research and clinical trials need to be done before the findings can be widely applied. What are the different types of CI available now? Immunostimulants are non-specific agents that tune-up the body’s immune defences. There have been some success with interleukin-2 (IL-2), a potent growth factor for T cells, which have been used in kidney and malignant melanoma, while alpha-interferon (IFN) are used for the treatment of chronic myeloid leukaemia and hairy cell leukaemia. Monoclonal antibodies are identical because they are produced by one type of immune cell – all clones of a single parent cell. Currently, most of the antibodies used are produced by recombinant DNA technology. The basis of monoclonal therapy is that different tumours have unique tumour antigens on their surfaces, and the identification of such antigens, such as CD20 on lymphoma cells, and the production of anti-CD20 antibody, ie rituximab, enables a targeted hit on the tumours. This will result in selective killing of lymphoma cells. Indeed, the advent of rituximab has changed the landscape of lymphoma treatment, with improvement in response and survival of patients. Similarly, other monoclonal antibodies such as herceptin (breast cancer), bevacizumab (lung cancer), and alemtuzumab (chronic lymphocytic leukaemia) are making waves in cancer treatment. Monoclonal antibodies can be modified for delivery through toxin, radioisotope, cytokine or other active conjugates. Many such conjugates have been tried with some success. Mylotarg was licensed by the US Food and Drug Administration (FDA) for treatment of acute myeloid leukaemia (AML). Myelotarg is a combination of anti-CD33 and calicheamicin (a cytotoxic compound). However, it was recently withdrawn from the market due to potential severe liver damage. Monoclonal antibodies against tumour antigens can also be coupled to radioactive atoms. The goal with these agents is to limit the destructive power of radiation to those cells (cancerous) that have been “tagged” by the attached monoclonal antibody. Zevalin is a monoclonal antibody against the CD20 molecule on B cells (and lymphomas) conjugated to the radioactive isotope yttrium-90 (90Y). The results in treating B cell lymphoma with radioimmunotherapy are encouraging, though the delivery of such an agent is somewhat cumbersome. 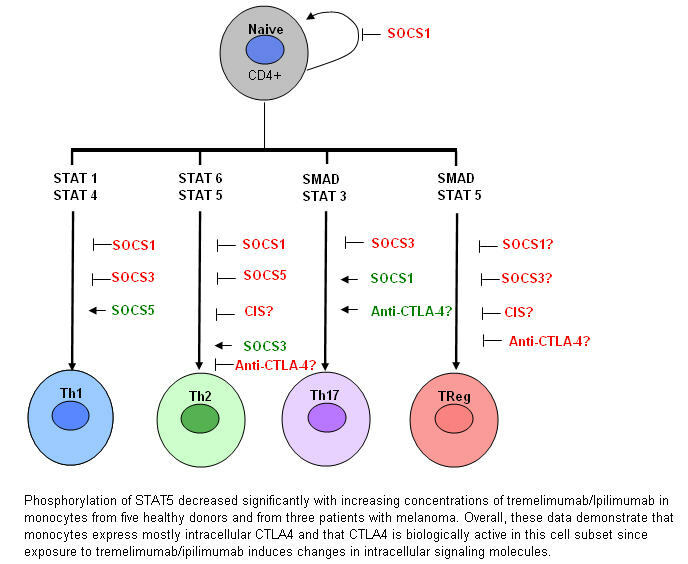 T lymphocytes such as cytotoxic T lymphocytes (CTL) are capable of killing target or tumour cells. How to prime them to act appropriately, ie to kill tumour cells and not other normal cells, remains the challenge. The main reason why allogeneic bone marrow transplants (allografts) work is because of the the post transplant continual attacks on the tumour cells by T cells (graft versus tumour effect) seen in many patients. However the accompanying graft versus host reaction can be severe enough to result in significant mortality and morbidity to the transplant recipient. The same effect of such immunological attacks on tumour cells can be harnessed by donor lymphocyte infusion. This is a double edged sword and needs to be used with extreme caution. Infusion of own or autologous T cells or genetically modified T cells have been attempted with limited success. The response of the patient’s own immune system – immune surveillance – has clearly failed in cancer patients. The purpose of cancer vaccines is to elicit a more powerful active immunity in the patient. Several approaches are being explored. The name “cancer vaccines” is somewhat misleading, as these vaccines are developed to cure cancer and not to prevent it. Dendritic cells (DC) are the most potent antigen-presenting cells. They engulf antigens, process them into peptides, and “present” them to T cells. The making of the vaccine entails, firstly, harvesting DC from patients and exposing them to tumour specific antigens. By injecting the “stimulated” DC back to the body, they may be able to elicit a strong immune response and attack the tumour, utilising the stimulated cytotoxic T lymphocytes. On April 29, 2010, the FDA approved the first anti-cancer vaccine, a patient-specific dendritic cell vaccine for use against advanced prostate cancer. Tumour-antigen specific vaccines are used to immunise the patient with an antigen universally expressed by tumours of that type (but not by normal cells), mixed with some form of adjuvant that will enhance the response. Unlike patient-specific vaccines, these vaccines can be mass-produced for use in anyone with the appropriate tumour. What are the strengths of immunotherapy? The most appealling point of CI is that potentially, this is a targeted therapy, and hence the side effects to normal cells would be considerably less. Some chronic myeloid leukaemia patients with relapsed disease post-bone marrow transplant managed to attain long term survival after donor lymphocyte infusion. 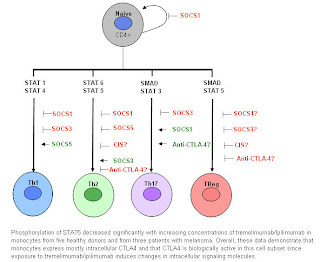 CI is a very powerful tool indeed, if only we know how to apply it optimally, but we are still grappling how best to titrate the graft versus leukaemia response. Because the side effects are different from conventional chemotherapy, the combination of cytotoxics and immunotherapeutic agents such as rituximab has improved the outcome in lymphoma patients without additional side effects. Because of the favourable safety profile, CI can be given in repeated courses, unlike cytotoxics, which are limited by their cumulative toxicities. What are the weaknesses or problems of immunotherapy? The main problem is likely to be the need for time for the immune system to respond to CI, and in some patients with cancer which behaves like a runaway train, eg Burkitt’s lymphoma, time is what the patients do not have. CI is unlikely to work in a large volume tumour, and the tumour needs to be debulked (reduced in size) before CI has a chance to work. CI is costly, and the price is not likely to go down in the near future. Monoclonal antibodies are fabulously expensive. This is even so for a personalised vaccine. For patients who have financial constraints, money is not everything – it is the only thing! Hence, it is likely that such treatment may not be available to those who need it, unless some assistance programme is forthcoming. It is unlikely that CI alone can cure a cancer in the setting of cancer patients whose immune systems have failed them in the first place. We need to learn and strategise how to put different treatment modalities, ie chemotherapy, CI, radiotherapy, in a winning treatment combination. The answer can only come with more painstaking research and careful clinical trials. Is immunotherapy devoid of side effects? A resounding NO. Any form of treatment can potentially give rise to side effects. Even taking paracetamol can cause severe allergic reactions, although rarely. Rituximab commonly gives rise to infusion reactions, which are manageable. 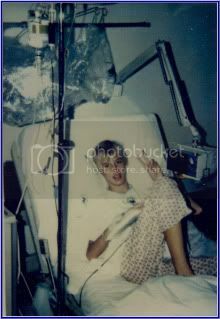 In 2006, in one of the phase 1 trials of a T cell stimulatory monoclonal antibody called TGN1412 in England, all six of the volunteers were nearly killed, and ended up with multiple organ damage due to unrestrained generalised T cell stimulation. So forget about the no side effects talk. I believe the side effects of immunotherapy are different from conventional treatment like chemotherapy, and we have to learn about them (both short term and long term), and deal with them accordingly. For instance, we now know that the use of chemo-immunotherapy in treating non-Hodgkin’s lymphoma can cause potentially fatal hepatitis B virus activation. This problem is prevented by concurrent antiviral therapy. How does CI fit into a patient’s treatment plan? Can a patient ask for immunotherapy first before following established treatment or can CI be the sole form of treatment? I feel the best person to answer the question is the oncologist/haematologist who is looking after the patient. CI with monoclonal antibodies can be used in induction (initial treatment) or to consolidate the treatment, and in some instances, to remove any minimal residual disease. Cell-based immunotherapy remains experimental and is likely to be offered in a setting of clinical trials. Very rarely is CI used as the sole form of therapy. I honestly feel that clinicians should make the decision. Using inappropriate therapy results in loss of valuable time in tackling the cancer, not to mention the accompanying financial toxicity! What are the basic questions to ask when one checks out immunotherapy? The patient really needs to know what he or she is in for. Is the centre a reputable one, and is the treatment approved by authorities such as the FDA or EU (European Union)? Is the treatment potentially curative or merely palliative? Are there other treatment options which may work just as well? What does the procedure entail and what are the potential side effects? The patient, together with the attending doctor, should weigh the benefit versus risk equation, and also the cost effectiveness of the planned treatment. In other words, one should go into any treatment only with eyes widely open. When a treatment sounds too good to be true, it usually is. Is CI ready for prime time? It is important to keep our feet firmly on the ground and not be taken by sales propaganda. In some forms of CI, such as monoclonal antibodies treatment, many lives are prolonged and saved, and monoclonal antibodies is now an established treatment modality. We need to tread far more carefully in cell based therapy. To date, the FDA has only approved one, and only one, cancer treatment vaccine, i.e. Provenge (sipuleucel-T). The vaccine is designed for men with advanced prostate cancer who have limited treatment options. Patients will have immune cells purified from their blood, and then combined with a specific protein (an antigen) that stimulates the immune cells to recognise and kill prostate cancer cells. The custom created vaccine is given intravenously in three doses, two weeks apart. Potential reactions include fever and flu-like symptoms. Before we get carried away, the new treatment resulted in a very modest 4.1 month improvement in median survival compared to the placebo group. Why the surge in interest in CI? According to the American Cancer Society, immunotherapy, especially cancer vaccines, is still a small field which hasn’t yet proven itself to be better than other types of cancer treatments. However, it’s one that researchers say holds a lot of promise and “many future advances against cancer will probably come from this field”. Interestingly, Time magazine voted in two cancer researchers, Dr Larry Kwak and Dr Doug Schwartzentruber, for its 2010 list of 100 most influential people in the world. Both of them are in the forefront of cancer vaccine research. Dr Kwak is involved in BiovaxID patient-specific vaccine for follicular lymphoma while Dr Schwartzentruber is researching a melanoma vaccine. Both vaccines had good phase 3 trial results and may make their way to bedside use soon. Is there a need for regulation of CI in Malaysia? The answer has to be yes. Unfortunately, we have no shortage of entrepreneurs, and for new therapies, whether it’s stem cell based or cell based, medical supervision is necessary to protect our patients. We don’t want to make news for the wrong reasons. At the end of the day, we should heed Hippocrates’ wise words – to cure sometimes, to comfort always, and not to cause any harm to our patients. This article is contributed by The Star Health & Ageing Panel, which comprises a group of panellists who are not just opinion leaders in their respective fields of medical expertise, but have wide experience in medical health education for the public. Datuk Prof Dr Tan Hui Meng, consultant urologist; Dr Yap Piang Kian, consultant endocrinologist; Datuk Dr Azhari Rosman, consultant cardiologist; A/Prof Dr Philip Poi, consultant geriatrician; Dr Hew Fen Lee, consultant endocrinologist; Prof Dr Low Wah Yun, psychologist; Datuk Dr Nor Ashikin Mokhtar, consultant obstetrician and gynaecologist; Dr Lee Moon Keen, consultant neurologist; Dr Ting Hoon Chin, consultant dermatologist; Prof Khoo Ee Ming, primary care physician; Dr Ng Soo Chin, consultant haematologist. For more information, e-mail starhealth@thestar.com.my. The Star Health & Ageing Advisory Panel provides this information for educational and communication purposes only and it should not be construed as personal medical advice. Information published in this article is not intended to replace, supplant or augment a consultation with a health professional regarding the reader’s own medical care. The Star Health & Ageing Advisory Panel disclaims any and all liability for injury or other damages that could result from use of the information obtained from this article. For cancer patients, close is not good enough. Andrzej KrauzeImagine a land where every year a deadly plague afflicts 53,000 people—enough to fill a small stadium. Most are fortunate enough to discover their illness early, when it is completely curable. But 8,000 are not so lucky and their disease spreads to other parts of the body, with lethal consequences. 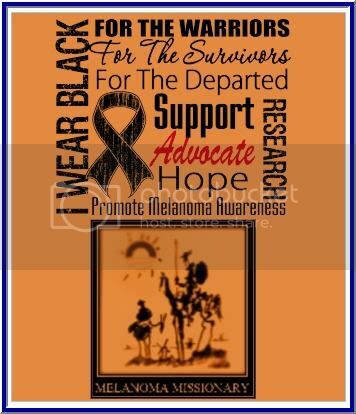 Imagine this happening each year, with little reduction in the numbers who die, and you will understand the toll melanoma takes on patients and their families in the United States alone. An electrical switch for cancer? Currently, there are only two FDA-approved treatments for patients with metastatic melanoma: dacarbazine and interleukin-2. These treatments have complete response rates of 2.7 percent and 6.3 percent respectively. A durable complete response—the disappearance of all cancer—is the holy grail of cancer treatment. While patients can sometimes benefit enormously from partial responses, every patient aspires to become cancer free. Studies have shown that in the case of metastatic cancer, any residual tumor cells not killed by therapeutic intervention will ultimately grow back. Two new treatments, ipilimumab and PLX4032, will probably soon receive FDA approval. While both improve the survival of late-stage metastatic melanoma patients, their reported rates of durable complete response are 0.6 percent and about 2.0 percent, respectively. The difficult reality for melanoma patients is that partial response with any of the available treatment offers only a temporary respite in disease progression. Of course, living with cancer is better than dying from it, but oncologists have not yet been able to achieve a “stasis” of disease like that seen in patients with HIV. Although there are exceptions, delays in the progression of metastatic melanoma after an incomplete response to treatment are usually measured in months, not years, and most of these patients will die from their disease. A durable complete response—the disappearance of all cancer—is the holy grail of cancer treatment.Adoptive cell transfer (ACT) might offer more than simply hope to people who have failed on these and other treatments. ACT employs methods that involve extracting a patient’s antigen-specific immune cells, usually found in tumor tissue, and expanding the number of these antitumor T lymphocytes ex vivo. When the cells are reinfused intravenously together with the T-cell growth factor (interleukin-2), they are demonstrably capable of trafficking to the tumor and mediating its destruction. The addition of “preparative lymphodepletion”—the temporary ablation of a cancer patient’s immune system—can be accomplished using chemotherapy alone or in combination with total-body irradiation, and is associated with enhanced persistence of the transferred T cells. ACT can lead to prolonged tumor eradication even for patients with stage IV metastatic melanoma who have exhausted other treatment options. While oncologists are always hesitant to use the word “cure,” mature clinical trials of ACT have demonstrated the disappearance of all tumor in 20/93 patients treated (21.5%). Most importantly, for 19 of these 20 patients (95%), the complete responses have been durable and long-lasting, with some patients remaining disease free for more than 7 years (J Clin Oncol, 26:5233-39, 2008; updated 2010). For these patients, ACT-based immunotherapy may well represent a cure. If ACT-based immunotherapies have the potential to cure one in five patients with metastatic melanoma, why is the procedure only available in a handful of locations worldwide? Why is there so little commercial interest in developing this therapy? What can be done to facilitate the more widespread administration of ACT-based immunotherapies? The first explanation for the scarcity of these treatments is financial. ACT-based immunotherapies are still considered experimental, are not FDA-approved, and are not paid for by patients’ insurance. Thus, only a handful of locations are able to bear the fiscal burden of administering ACT. But how heavy is that burden? Assuming the host institution has a cell production facility and the specialized staff to run it, the cost for producing a single dose of adoptively transferred T cells is approximately $20,000 plus all costs associated with hospitalization for the treatment. However, even though the costs of ACT can be high, most patients only require a single dose. Estimated costs seem comparable to or less expensive than many of the recently FDA-approved cancer medications—such as bevacizumab (Avastin) or cetuximab (Erbitux)—where the price tag for the medicine alone can exceed $80,000, and no patients are cured. Although ACT-based immunotherapies are neither quick nor cheap, an immune-based approach this effective for a subset of patients is likely to represent a reasonable cost-benefit profile. It might seem perplexing that the private sector has not pushed for an FDA-approved licensing trial. However a clear path to profitability is still missing in the development of ACT-based immunotherapy for use in the medical marketplace. Not a simple injection or a pill, ACT-based treatments are uniquely tailored for each patient. The cost of entry into the field with a licensing trial includes construction of a specialized facility and the acquisition of highly trained medical and laboratory staff. There may also be a perception that ACT-based approaches lack a clearly defined claim to intellectual property (IP), which entices companies and their shareholders to invest in the development of new treatments. After all, it is not easy to own the “drug” used in ACT—the patient’s own T cells. However, recent financial success realized by Dendreon, the manufacturers of Provenge, which also uses autologous cells, may go a long way toward changing the attitudes of investors. Many aspects of antitumor T cell production might be patentable, and the use of patentable genetically engineered T cells could provide the type of clearly defined IP that investors seek. Some may argue that a more appropriate sponsor for ACT-based immunotherapy is the cash-strapped public sector. It seems more likely that a network of cancer centers, institutes, and hospitals could form a consortium to refine ACT technology and sponsor an FDA-approved licensing trial. A successful trial and FDA approval for ACT-based immunotherapy could result in a financial windfall for participating institutions. It also seems plausible that leaders from the not-for-profit sector could step forward. A social entrepreneur or “dot-org” research foundation could potentially catalyze the widespread application of ACT technology. Adding to the list of cancers treatable with ACT could provide a new group of stakeholders with the impetus to push the concept forward. Although most of the work done thus far has been focused on melanoma, current efforts have enlarged the list of cancers treatable with ACT to include synovial-cell sarcomas and B-cell lymphomas. These new examples will hopefully encourage corporate and nonprofit entities to envision the possibility of treating more-common cancers, such as those of the lung, breast, colon and prostate, which offer bigger targets for cure, as well as larger financial incentives. Although the use of ACT-based treatments remains confined to a handful of centers worldwide, the employment of a patient’s own immune system to eradicate cancer is a strategy that can no longer be ignored. Nicholas P. Restifo is a principal investigator at the National Cancer Institute’s Center for Cancer Research, where he works on designing new immunotherapies for patients with advanced cancer. Megan Bachinski is a writer and editor living in Silver Spring, Maryland. Instead of using ACT therapy (Growing the cells outside body in flasks), What if you did it in vivo. (Inside the Body) This can be done with Combinatorial Therapy with the help of the newly approved Yervoy (Ipilimumab) and Interluekin-2.